The departure of Priti Patel from government has merely accelerated Theresa May’s metamorphosis from “strong and stable” to a new incarnation of John Major’s doomed administration which was ultimately swept away by the Blair landslide. Hold, for a moment, your dreams of a 179-seat majority – given the tight and fluctuating opinion polls I would be glad of one of a fifth of that size – and concentrate on the circumstances of how the prime minister lost her international development secretary. Of all the bizarre chapters in the story of Patel’s demise, her meeting with May on Monday stands out. The prime minister held a face-to-face meeting with one of her cabinet charges in which, we are told, Patel was given a “reprimand” and asked to provide details of the secret meetings which she had carried out while on a “family holiday” in Israel this year. 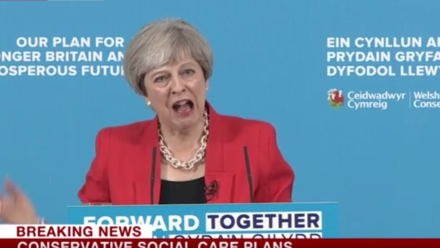 In short, May gave her a slapped wrist rather than the P45 she deserved. So when, soon after, it emerged that the Brexiteer minister had hooked up twice more with senior Israeli officials – public security minister Gilad Erdan in Westminster and foreign ministry official Yuval Rotem in New York – without the British government being aware then it appeared she had not been honest with the prime minister. As such, Patel was toast and it was only a matter of time before she packed her bags – or re-packed them, given that she has been doing a lot of travelling – and left the Department for International Development. Another aspect of this strange story is that Patel was not sacked – at least if you accept the official version of events. The BBC reported last night that the cabinet minister had “resigned having been told by the prime minister to return from an official trip in Africa and report to Downing Street”. This may reflect the requirement on the Beeb not to use the scathing language beloved of newspaper hacks (a tribe of which I was once part) but the euphemism seems to be catching because it has popped up in other media this morning as well. Surely, after being hauled back from Kenya for a showdown in Downing Street, and then leaving office, this qualifies as a sacking? May came close to spelling out her anger in the traditional response to Patel’s departure letter, when she wrote: “Now that further details have come to light it is right you have decided to resign”. Oh so that’s ok then. Patel was merely doing the decent thing having had an embarrassing mix-up about the level of authority which had been bestowed upon her. To ask anyone to believe that would be simply incredible. Patel was forced out – yes, sacked – because of her shameful lack of transparency. Indeed. Of course, Patel is merely the latest in a line of former cabinet ministers whose troubled relationship with the truth prompted her downfall but the manner of it, with 20,000 people tracking the progress of her flight back from back from Africa yesterday, was excruciating to watch. The whole dire episode underlines May’s weakness, confusion and sense of drift. She is not shaping events or even trying to control them but simply being buffeted by them. Her predecessor as the lame duck Tory PM in Major – now Sir John – once admitted that the line from Tony Blair that stung him most was when, in 1995, the then leader of the opposition taunted him: “I lead my party, he follows his”. It hurt because it was true. “Weak, weak, weak”, Blair shouted two years later as the election finally loomed. For Major, who had won the national vote convincingly five years earlier, it probably came as a relief to retire. We all know how the 1997 poll ended. I doubt that Jeremy Corbyn, a former backbencher, is the type to dream of a 179-seat majority but what the events of the last week show are that May’s failures mark her out as a match for the miseries of Major. She has nothing left to offer.